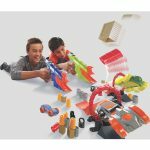 When it’s the end of the world, kids need Nerf’s new Zombie Strike Brainsaw Blaster. It seems like Zombies are everywhere today, but what about toys? Nerf has an entire line of Zombie themed blasters called Zombie Strike. 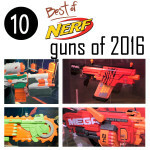 At Toy Fair 2016, Nerf unveiled its newest blaster. The $30 Zombie Strike Brainsaw Blaster is a 2 in 1 blaster with a working foam blade. While Popular Mechanics broke the story early, we finally got to see the blaster at Toy Fair 2016. 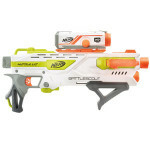 Zombie and Nerf fans may want to add this gun to their Christmas toy wishlist. The Zombie Apocalypse is coming. What kind of weapon would you like to have in order to survive a pack of hungry zombies? A chainsaw wouldn’t be bad. 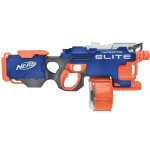 Now kids can pretend to rip through zombies with a plastic chainsaw from Nerf. With its spiked shape, we love this size of this blaster. It’s so large that you need the handle to keep the blaster steady. This new Nerf gun of 2016 looks as cool and ridiculous as it sounds. Looking like the Lancer out of Gears Of War, this blaster is equipped with a working foam chainsaw on one end. When the zombies get in close, you can cut them down by pulling back the string to rev the foam blade. An automatic blade would have been even cooler. The entire chainsaw doesn’t spin just the wheel on the front. The rest of the blade is just cosmetic. While it might not be the best Nerf gun, this eight barreled gun has got some fire power too, packing four darts on each side of the blade. When the zombies finally take over, kids are going to need more than fire power to keep the zombies far. 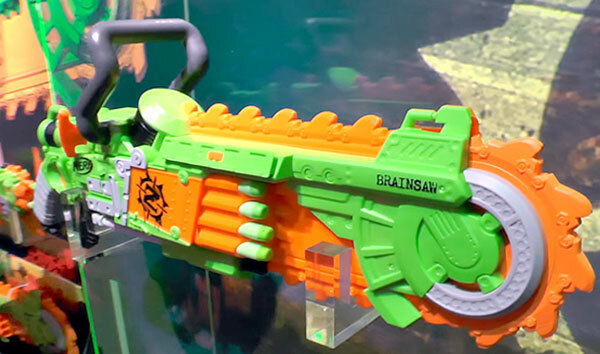 With the Zombie Strike Brainsaw Blaster, Nerf has come up with a kid friendly foam blade that actually spins around. Parents don’t have to worry about any accidents happening as the foam blade can’t actually cut through anything or injure anyone. It will be fun to hold the chain saw blaster in the air while spinning the blade to scare off opponents. While it won’t actually do any damage, it makes for some fun and friendly role play.